After a year of fighting for his illness, “Mang Gerry” Velasquez met his Creator at around 1:39 pm today, January 3, 2014. This was posted and confirmed by Regine Velasquez through her Instagram account. Because of this, there are so many other celebrities who sympathized with Velasquez family’s grief over their loss of “the leader of the band.” Celebrities include Jed Madela, Zsa Zsa Padilla, Lea Salonga and many more expressed their condolences and grief for the death of Mang Gerry. Mang Gerry was rushed to the hospital and died atsleep. He was 76 years old when he left this world. 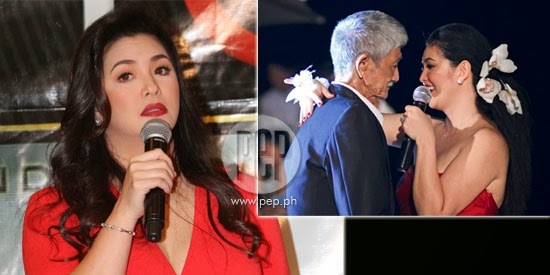 Aside from pneumonia, Mang Gerry also suffered from emphysema. Life has to continue for Regine and her family despite the fact that they are facing this particular moment of their life. Mang Gerry has been a responsible father to them and has taught them so many lessons in life that they will always remember and cherish. And since he has already gone with his Maker, the family has nothing to do but be strong and believe that these things shall pass because God is their Comforter.